An artist’s impression showing a galaxy with a molecular outflow. The detection of outflows powerful enough to strip galaxies of their molecular gas reservoir represents solid evidence in support of the merger-driven scenario for the formation of elliptical galaxies. Winds 10,000 times faster than an Earth hurricane’s have been seen streaming molecular gas – the raw material needed to make new stars – away from galaxies. These raging galactic windstorms may have the power to strip galaxies of gas and halt star formation altogether, European Space Agency researchers say. "With Herschel, we now have the chance to really study what these outflows mean for galactic evolution," said Eckhard Sturm from the Max Planck Institute for Extraterrestrial Physics, in Germany, who was lead author of the new study. Sturm and his colleagues used Herschel's Photoconductor Array Camera and Spectrometer to study 50 galaxies. Their first paper focuses on six galaxies from the sample. From their study, the researchers infer that mass 1,200 times as great as our sun’s is being lost each year from the galaxies with the most-vigorous outflows. This would be enough to strip the galaxies of their entire reserves of star-forming gas in less than 100 million years. Some galaxies could completely expel their star-forming gas in as little as a million years, the study suggests. The winds could be generated by the intense emission of light and particles from young stars, or by remnant shockwaves from the explosion of old stars. The windstorms also could be triggered by the radiation released as matter swirls around a black hole at the center of the galaxy. The fastest outflow winds appear to be coming from the galaxies that contain the brightest "active galactic nuclei," which is a giant, active black hole at the galaxy's center that feeds from its surroundings, the researchers say. Sturm and his colleagues are now testing this hypothesis with the other galaxies in their sample. 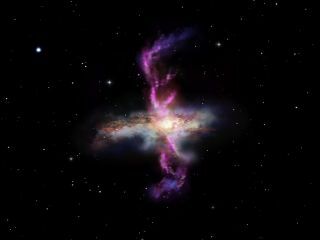 The results of the study could be a step toward explaining how some elliptical galaxies are formed. Elliptical galaxies are vast islands of stars that have now stopped producing substantial numbers of new stars because they have exhausted their gas supplies. As smaller galaxies interact and merge with one another, more matter is gobbled by the central black hole in the combined nucleus, making it larger and more active. This could result in a more powerful wind, which strips away the molecular gas and prevents further star formation from taking place, eventually leading to an elliptical galaxy. "By catching molecular outflows in the act, Herschel has finally yielded long-sought-after evidence that powerful processes with negative feedback do take place in galaxies and dramatically affect their evolution," said the European Space Agency 's Herschel project scientist, Göran Pilbratt.